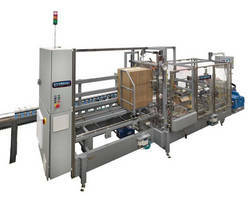 CHICAGO, IL (OCTOBER 28-31, 2012) - Schneider Packaging Equipment has developed a new Auto-adjustment Package (AP) to speed up case packing product changeovers debuting at Pack Expo 2012, McCormick Place, Chicago, October 28-31, 2012, Booth# 1228. As manufacturers are faced with the increasing demand to produce more SKU's on existing equipment, the need to both improve line efficiency and reduce changeover time is paramount. The AP is designed to address the need by providing a solution that can be added onto existing case packing equipment as a field retrofit or as an available low cost option on new equipment. The key to the field adaptability is that the AP features its own controller with an easy to use interface that makes installation, setup, and operation a snap. This avoids heavy modifications of the machine's existing controls speeding up installation. The easy to use interface simplifies SKU setup, and a simple handshake to the existing machine controller simplifies operation. "By automating many adjustment points on a machine product changeovers are faster and just as importantly accurate, greatly enhancing machine uptime performance and overall equipment effectiveness," indicates Terry Zarnowski, Director of Sales and Marketing. Whatever the requirements, Schneider works to provide the best solution for any unique need. Schneider Packaging is an Authorized Servicing System Integrator for FANUC Robotics and is a Machine Builder partner in the Rockwell Automation PartnerNetwork(TM) program. For more information, contact our sales department by phone at (315) 676-3035, fax at (315) 676-2875, email sales@schneiderequip.com or visit www.schneiderequip.com.